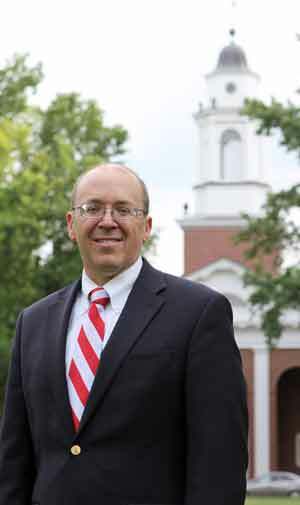 Dr. Gregory Hess, Wabash College’s 16th President, will ring in his first freshman class Saturday in the Pioneer Chapel. Hess will welcome 245 young men to their first official day on campus. The Class of 2017 begins its journey with the traditions of Freshman Saturday. Registration opens in the Allen Center at 9 a.m. with paper work and procedures to start each freshman’s college career. A separate program for parents will run concurrently while students are moving into dorms and fraternities across campus. Parents will have the opportunity to attend programs on fraternity life, meet the deans, and interact with faculty. Hugs and goodbye are requested between 4-5 p.m. But the highlight of the day for students and parents is the traditional Ringing In Ceremony at 1 p.m. Dean of Students Michael Raters ’85 will welcome everyone. Senior Associate Director of Admissions Walter Blake will talk about the Class of 2017. Greg Estell ’85, President of the National Association of Wabash Men, will welcome students and parents on behalf of the alumni. The day’s highlight will be President Hess’s first public speech on campus as the College’s new president. At the end of those remarks he will take the bell of Wabash College’s first professor, Caleb Mills, and ‘ring in’ the Class of 2017. The Ringing In Ceremony will be streamed live on the Wabash College website here. Orientation wraps up Wednesday but with two of the more memorable events after the ringing in. All 245 young men will spread across the Montgomery County community and work a morning of community service. Orientation ends Wednesday then the serious work of classes begins the next morning. The freshmen will cap their five days of orientation with an evening ice cream social at the Elston Homestead with President and Mrs. Hess.